Global Documentary – Another world is possible. We make films and run events and webcasts that focus on positive change, for people, societies and the planet, both locally and globally. Seeing is believing, and if people can see, they can understand, they can get involved. Southampton is in the top ten most polluted cities in the UK. This hustings event gave local people a chance to question politicians about how they plan to tackle air pollution and bring cleaner air to our city. A team from Southampton visit Holland to witness first hand their incredible cycling culture. The team consider what elements can be taken home and incorporated into city life in Southampton.. Being a beast machine, Nov 2016, 17minutes. What explains the experience of being a conscious self – of being you? Drawing on cutting-edge cognitive neuroscience and old ideas from psychology and control theory, Anil Seth describes how our conscious selves emerge from a fundamental biological drive to stay alive in an unpredictable world. ’The Race is On’ will show how the UK could be transformed into an ultra-low carbon society that is fit for our children’s future - pretty amazing right? This utterly huge shift may be the greatest and most urgent transformation of our generation - it’s a race against time. Made specifically in time for the UN COP21 Climate Conference. The historic decisions that global society take now really do matter in maintaining a safe environment. This film explores key issues that surround this global meeting. People can take effective action and 'The Environmental Litmus Test' is a clarion call to action. Connected asks questions about what kind of future we all want to see. Filmed on a journey across Europe, the film seeks to connect with others to discuss key issues that affect us all on a global scale. Connected shows the real urgency for everyone to get involved and positively working towards change on many levels in order to secure a sustainable and fair world for future generations to inherit. Author George Monbiot and musician Ewan McLennan seeks to address the curse of our age: a crowded planet stricken by loneliness. Embrace the Change, Nov 2014, Live, 2hours 15minutes. A live and interactive webcast about solutions for the future. Featuring key speakers from Economy, Environment, Media and Personal Change and music from Martha Tilston & The Scientists. A short parable for modern day living that connects past, present and future. On the verge of a life overrun, will Milly break free? Made live on site for inclusion in a live webcast event that we produced. This short film reflects the thoughts of those at the conference, and asks people to reflect on what's happing in the International Transition Movement. The Sustainability Centre are an independent learning centre, a beacon for sustainability and an award-winning social enterprise charity in the heart of Hampshire's South Downs in the UK. Positive News is the world's first positive newspaper. They report on positive developments from across the world and take a solution-focused perspective on the challenges facing society. What is live interactive webcasting? A look behind the scenes from this event. Ecocide - destruction of the natural environment, especially when deliberate. "Their crime is nothing less than attempted ecocide"
Live with her band The Woods, Martha reminds us that it's a 'Good World'. 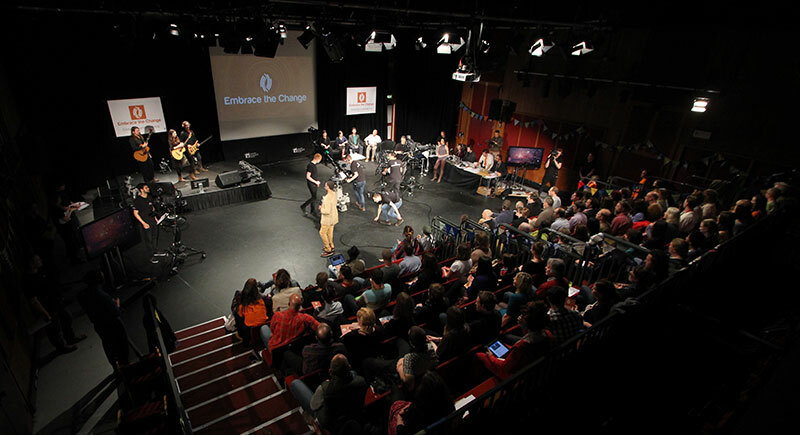 Founder of Embercombe Tim 'Mac Macartney addresses a live studio audience at Embrace the Change March 2014 to talk movingly about personal change and how individuals can make positive social change happen. The most recent climate science demonstrates the need for us to respond at a much faster rate than is currently accepted by the mainstream. There is an urgent need to achieve zero carbon emissions as soon as possible. A case study of real positive change in action. Llammas consider what they are doing is a blueprint for future living. This is not about opting out, it's opting in! Global Documentary is born out of the idea that if we want the world to become a better place, then it is necessary to actively seek out better ideas, and communicate them in order to help shape our global conversations.